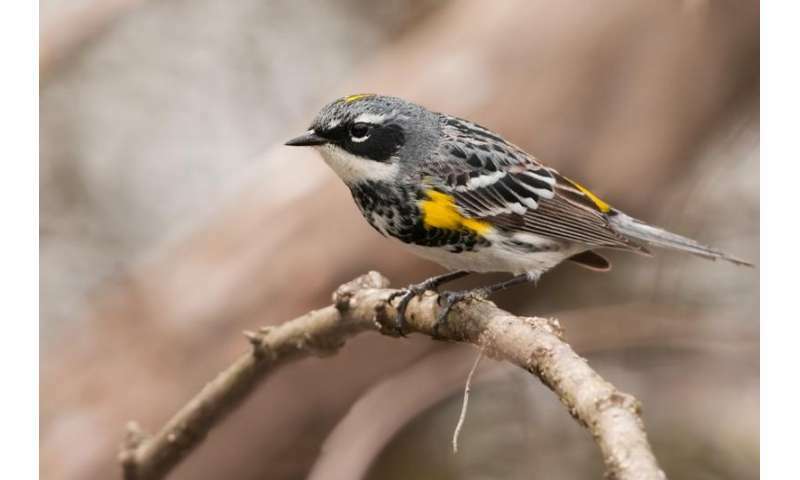 One of North America's most beloved songbirds – the yellow-rumped warbler – may need to be considered at least three separate species, says a study published Aug. 24 in The Auk. This discovery contradicts how ornithologists classified the bird for almost five decades. The new work brings a wealth of genetic evidence to bear on the question and for the first time identifies where in the warblers' DNA species have diverged from each other. That opens the door to discovering what's responsible for differences in how the birds look, sound and act, said lead author David Toews, a postdoctoral researcher at the Cornell Lab of Ornithology. "The yellow-rumped warbler – this species that's familiar to just about every birder in North America – has four distinct forms, and now we have quite compelling evidence that three of them are full species," said Toews, who began the work while he was a doctoral student with study co-author Darren Irwin at University of British Columbia. It's not the first time the 5-inch-long, half-ounce birds have prompted debate among ornithologists. For most of the last century the yellow-rumped warbler was known to bird-watchers as two species, the myrtle warbler of the East (and far north) and the Audubon's warbler of the West. But in 1973 evidence the two species routinely hybridize in a narrow zone in western Canada led scientists to reclassify them as a single species. Affectionately known to bird watchers as "butterbutts," yellow-rumped warblers are abundant migrants that pass through North America each spring and fall in most of Canada and in every U.S. state except Hawaii. Summer finds the gray-and-yellow birds in the evergreen forests of Canada, the mountainous western U.S. and the Northeast. They spend winters farther north than most warblers, in the southern U.S. as well as in Mexico and Central America. Now, evidence from more than 37,000 regions of the birds' DNA suggests myrtle and Audubons are separate species – and so is a third, isolated form known as Goldman's warbler that is almost entirely restricted to Guatemala. If given full species status, its restricted range and low numbers would make it an immediate target for conservation. A fourth form known as the black-fronted warbler lives in the mountains of northern Mexico but its species status is more debatable, the study authors report. The wealth of data provided enough resolution for the researchers to see clear patterns of natural selection despite relatively small overall genetic differences. For instance, differences between myrtle and Audubon's forms were clustered within only about 60 relatively short regions of DNA. These hotspots likely contain the genes responsible for making myrtle and Audubon's warblers different, Toews said. Natural selection likely caused those genes to change while leaving the rest of the birds' DNA relatively unaltered. It is thought the myrtle and Audubon's forms became separated over the last million years. Toews thinks that at some point, birds that became the myrtle form moved eastward from northwestern North America and became cut off from the other three forms by ice sheets. That long period of isolation explains why myrtle is the most distinctive of the four forms, he said. Although the myrtle and Audubon forms interbreed freely in a narrow zone just 80 miles across, some sort of weakness in hybrids keeps them from surviving and carrying the genetic mixing farther afield. That weakness is the reproductive barrier that qualifies myrtle and Audubon's as biological species, Toews said, although what it is, exactly, remains to be discovered. Is Myrtle Rust the new threat to native fauna?